What could be regarded as being one of the biggest draws for people choosing to live in a residential park home is the chance to enjoy an affordable, convenient and comfortable way of life. Park homes, can already be furnished before you move in are very spacious yet manageable homes. This is a particularly important benefit for individuals who have perhaps made the decision to downsize from their old property into a home which is more suited to their needs, whilst still providing plenty of space. Making a house a home is important to us all, especially if you’ve moved into your park home fairly recently. As we all have different tastes in styles and ideas of how we want our homes to appear and be used, there are no set rules in how to design your home as it really is up to personal preference! However, if you are looking to give your park home a bit of a revamp or you are thinking of selling your park home, then here are 10 simple but effective ways to incorporate a new style or refreshed interior design into your park home. It sounds simple, but moving furniture away from the walls can help in creating a more intimate and less formal setting according to designer Betsy Burnham in HouseBeautiful’s article discussing decorating tips for the home. You might feel discouraged to move furniture around in your park home so as to retain as much as the space as possible, however, strategic placing of furniture to ensure that the room doesn’t feel cramped should definitely help, therefore, don’t be afraid to move the furniture around until you’re happy it feels right. If you have recently downsized from your property to a park home, then you could be struggling to find available space to store your possessions. This is where the space underneath your bed or wardrobe could suddenly become useful. Simply purchase some cheap storage boxes for your items and then place them out of site. Even if you’re struggling to locate space to place your containers, choose some nice boxes or ones you wouldn’t mind having on view such as wicker baskets. The fact that your items have been organised into some sort of storage solution will instantly help in making a room appear less cluttered and more spacious. Alternatively, why not consider the likes of display cabinets such as these from Priest Brothers? 3. Being bold is good! Adding personality to your park home is what makes it your own personal space, so don’t be afraid to be innovative and try something new. Incorporating ‘unexpected elements of drama’ is one way to transform your home according to houzz article. The unique ottoman seats and library style bookshelves which you can take a look at here are great examples of adding something extra special to your home which can really add character to the home. Placing mirrors in and around your park home is another great stylish and space saving tip. Not only can mirrors add a touch of chic to a room, but by placing mirrors directly across from windows, this reflects the light into the room giving off a much brighter appearance, as well as making the room appear to be more spacious. 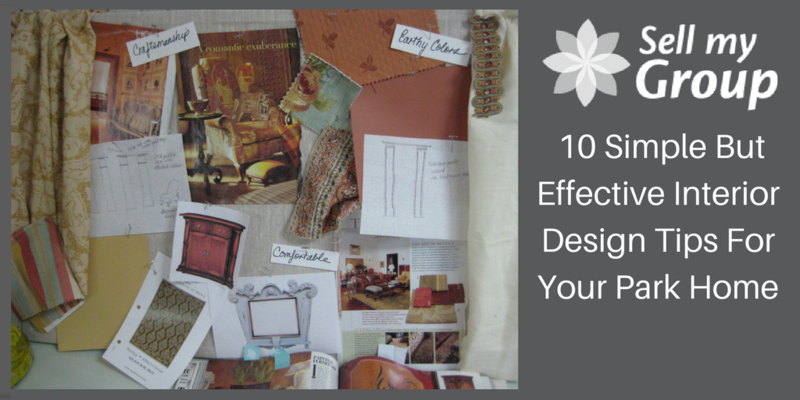 You don’t have to cram lots of different furniture into your home in order to create an impact. Therefore, try not to overload your room with lots of different pieces of furniture and instead adopt the mindset that less can sometimes be more. From a money-saving aspect, this is also an advantage as to why you should avoid overcrowding your home. Therefore, try saving your money on buying lots of different pieces of furniture and instead purchase fewer, but better quality items, and you’ll quickly be able to transform your home to create the perfect stylish look. One of the most common ways to try and maximise space in your home for a more stylish and modern appearance is to incorporate a lighter tone of paint onto the walls. This not only has the effect of making a room appear considerably larger and brighter, but it can also assist in helping you to accessorise your room more easily. Whether you’re looking to incorporate new artwork for the walls or statement furnishings around the home, lighter colours can really help to match your items more simply. Another top interior design tip which you could consider incorporating into your park home is that you can mix up home furnishings however you like. By this, we mean that you shouldn’t feel restricted to theming your accessories based upon whether they’re new or old, patterned or plain, expensive and inexpensive as explained by Fresh Home’s clever interior design tips. Having an antique vase doesn’t mean that the rest of the room’s furnishing need to follow suit, therefore, don’t be afraid to mix up your accessories. By integrating different items into your room, this will help add a little more interest and charisma. Lighting is both a clever and an interesting way of creating certain vibes for different rooms, which as you’ll probably have witnessed can help to make us feel differently when spending time in that particular space. Lamps, in particular, are a great tool for making a space feel warmer and more welcoming and are also a useful way in helping to enlarge the appearance of a room. Try to experiment which different styles of lighting and see which works well for different areas of your park home. Regardless of whether you opt for something simple or something more in the form of luxury lighting; it’s amazing what a difference the right lights can make to a room. For a fresh, clean and inviting feel, why not think about accessioning your park home with plants? Plants and flowers don’t only help in adding colour, texture and interest to the room, but they can also help to clean out the air and absorb pollutants. By bringing the outdoors indoors, this could also add a sense of calmness and serenity to your park home! Whilst themes can sometimes be a helpful way of organising the appearance of certain rooms, the truth is, you can often do something much more exciting and instead use your own personality as a theme! If you want to add a bit more charm and character to your park home, then avoid matching colour schemes, patterns and textures and instead see how you can incorporate a more warming yet original ambience and explore accessorising your home with unusual and interesting furnishings. As you can see, there are plenty of simple but effective interior design tips to add a touch of style to your park home, and this is just ten of them! Just remember, your park home is a special place which one ought to feel comfortable and enjoy spending time in. So don’t be afraid to be creative and try something new as this will only add personality and charisma to your park home. If you are thinking of buying a park home, take a look at at our informative blog.